A mutation in STAT3 has been linked to the incidence of autosomal dominant hyper IgE syndrome, a disease characterized by elevated serum IgE Ab. However, how this genetic mutation leads to the phenotype has not been fully understood. We investigated the specific role of STAT3 in the germinal center (GC) B cells and plasma cells for IgE class switching. Through the use of STAT3 conditional knockout (cKO) mice in a Th2-type immunization model, we demonstrated that CD2-Cre–driven STAT3 cKO mice showed elevated IgE and decreased IgG1 in the serum and a reduction in GC formation. Within the GC, IgG1+ GC B cells were decreased, whereas IgE+ GC B cells were more prevalent. Additionally, these mice exhibited reduced IgG1 and elevated IgE populations of Ab-producing plasma cells. Subsequent experiments using a CD19-Cre cKO mouse established this effect to be B cell–intrinsic. Transcription factors critical for GC and plasma cell differentiation, including Bcl-6 and Aicda, were shown to function as downstream signals of STAT3 regulation. Chromatin immunoprecipitation sequencing analysis revealed that many genes, including Bcl3 and Crtc2, were among the direct STAT3 regulated targets. Mice with STAT3 deficiency in B cells also demonstrated an increase in lung inflammation when used in an asthma-like disease model. This model suggests a negative role for STAT3 in regulating class switching of the GC B cells from the IgG1 to the IgE producing state, which may serve as a therapeutic target for treatment of autosomal dominant hyper IgE syndrome and other immune disorders. Production of the appropriate Ab class is a vital function of the B cell immune response. IgE is likened with defense against parasitic infections (1). IgE is also largely associated with hypersensitivity and allergic disorders (2). Hyper IgE syndromes are a group of immune disorders characterized by specific infectious susceptibilities, eosinophilia, and extremely high levels of IgE class Ab in the serum (3). One form in particular, autosomal dominant hyper IgE syndrome (AD-HIES), has been linked to heterozygous mutations in the STAT3 gene (4, 5). However, precisely how transcription factor STAT3 controls IgE production in AD-HIES has not been fully understood. Class switching primarily occurs in the germinal center (GC). In this unique microenvironment, recently activated B cells undergo class switch recombination and somatic hypermutation (SHM) to produce plasma cells, which secrete high-affinity Abs (6). STAT3 is well established as a major regulator of lymphocyte function, acting downstream of vital GC-related cytokines such as IL-4, IL-10, and IL-21 (7, 8). It has also been implicated as a critical factor for the development of Th2 cells as well as follicular helper T cells (Tfh), which are an essential component of the GC reaction (9, 10). Studies using B cells from STAT3 loss of function AD-HIES patients have revealed defects in many downstream effects of IL-21 and IL-10, including differentiation of Ab- secreting cells. Interestingly, these cells also demonstrate no alteration in their ability to class switch to IgM, IgG, and IgA forms (11–13). Reduced responses to vaccination and diminished memory B cell generation in these patients further suggests an important role for B cell function and Ab production (14). In mice, IL-21R deficiency has been shown to cause elevated IgE levels (15). Additionally, murine loss of STAT3 on B cells leads to decreased serum IgG levels, a hallmark of AD-HIES (16). Despite these associations, STAT3 has also been shown to be required for IL-21–induced IgE production in human B cells (17). This suggests a more complex involvement for STAT3 in IgE class switch regulation that may be reliant on STAT3-related signaling from other cell types in addition to B cell STAT3 expression. Indeed, B cell loss of STAT3 signaling through knockout or expression of a nonfunctional mutant has been shown to cause increased serum IgE and altered IgE affinity (18, 19). However, the underlying mechanisms behind this regulation remain poorly defined. In this study, we demonstrate that STAT3 serves as a negative regulator of B cell IgE class switching. Mice lacking STAT3 in both B cells and T cells exhibited an increased production of serum IgE in response to immunization as well as heightened IgE expression in GC and plasma cells. Similar effects were observed in B cell–specific STAT3 knockouts, indicating this as a mainly B cell–intrinsic defect. In addition, we found that STAT3 has similar regulatory effect on GC B cells in an Ag-independent in vitro system, suggesting that STAT3 also regulates IgE class switching downstream of non-BCR signals. Real-time PCR and chromatin immunoprecipitation sequencing (ChIP-seq) analyses indicated that many genes are directly or indirectly regulated by STAT3 in the GC B cells. Use of an asthma-like murine model resulted in increased eosinophil infiltration to the lungs of STAT3-deficient B cell mice, revealing a pathogenic role in hypersensitivity diseases. These findings demonstrate STAT3 as a key factor in regulating IgE class switching in a disease setting and a potential therapeutic target for treatment of AD-HIES. C57BL/6 T cell and/or B cell STAT3 conditional knockout (cKO) mice (STAT3fl/flCD2Cre/+ and STAT3fl/flCD19Cre/+) were generated by interbreeding STAT3fl/fl mice (20) (control) with CD2Cre/Cre or CD19Cre/Cre mice (The Jackson Laboratory), respectively. Mice at 6–8 wk of age of both sexes were used for experiments. All mice were housed and bred in a conventional facility at the University of Louisville. Animal care and experiments were conducted in accordance with the National Institutes of Health guidelines and were approved by the Institutional Animal Care and Use Committee at the University of Louisville. STAT3 control or cKO mice were immunized by i.p. injection with 100 μg of OVA in Alum adjuvant at a 1:1 ratio. Sera were collected before and at given time points after immunization. Anti-OVA Ab titers were measured via ELISA using a 96-well plate coated with 1 μg of OVA and a standard ELISA MAX kit (BioLegend, San Diego, CA). For IgE affinity detection, mice were immunized with NP23-CGG (Biosearch Technologies, Petaluma, CA). Sera were collected at day 14 postimmunization. Anti-NP Ab was measured using parallel ELISAs in which wells were coated with 1 μg of NP23-BSA or NP2-BSA. The OD value ratio was used to determine overall affinity. Fluorochrome-labeled mAbs against IgG1, IgE, B220, GL7, CD138, and viability detection Ab were purchased from BioLegend. Single cell suspensions were blocked in the presence of anti-CD16/32 and purified anti-IgE at 4°C for 15 min and stained on ice with appropriate Abs and isotype controls. For intracellular staining, cells were fixed and permeabilized followed by the addition of fluorochrome-labeled anti-IgE. Samples were acquired using a BD FACSCanto cytometer (BD Biosciences, San Jose, CA) and analyzed using FlowJo software (Tree Star, Ashland, OR). Splenic GC B cells and plasma cells were sorted by a BD FACSAria III. Total RNA was prepared with TRIzol (Life Technologies) and an RNeasy Mini Kit (QIAGEN, Valencia, CA). After reverse transcription into cDNA with a reverse transcription kit (Bio-Rad Laboratories, Hercules, CA), quantitative PCR (qPCR) was then performed on a Bio-Rad MyiQ Single-Color Real-Time PCR detection system using SYBR Green Supermix (Bio-Rad Laboratories). Primer sequences are listed in Supplemental Table I. Gene expression was normalized to the β2-microblobulin housekeeping gene and represented data as the fold differences by the 2−∆∆Ct method, in which the threshold cycle (Ct) = Cttarget gene − Ctβ-MG and ∆∆Ct = ∆Ctinduced − ∆Ctreference. Purified B cells (1 × 105) from naive STAT3 control or cKO mice were cultured in RPMI 1640 medium (Sigma-Aldrich, St. Louis, MO) (supplemented with 10% FBS, 5.5 × 10−5 M 2-ME, 100 U/ml−1 penicillin, and 100 μg/ml−1 streptomycin [Life Technologies, Waltham, MA]) on a 12-well plate in the presence of CD40L- and BAFF-expressing feeder cells that had been irradiated with 120 Gy gamma rays (6). rIL-4 (1 ng/ml; PeproTech, Rocky Hill, NJ) was added to the primary culture for 4 d. On day 4, cells were harvested, counted, and used for secondary culture or analysis. For secondary culture, 2 × 105 cells from primary culture were replated on a new layer of irradiated CD40L feeder cells with 10 ng/ml of rIL-21 for 3 d.
In vitro–cultured GC B cells from STAT3 control and cKO mice were used for chromatin immunoprecipitation studies as described previously (21). In brief, cells were subjected to sonication using a sonicator (AFA S220 Focused-ultrasonicator) to obtain chromatin fragments of 100–500 bp. Fragmented chromatin was incubated with STAT3 Ab (124H6; Cell Signaling Technology) or isotype control Ab and incubated for cross-linking with the beads (Dynabeads Protein G; Invitrogen). After cross-linking, cross-links were reversed (65°C for 12–16 h), and precipitated DNA was treated with Proteinase K and then purified (QIAquick PCR Purification Kit; QIAGEN). The DNA libraries were prepared, and sequencing was performed by Beijing Genomics Institute. The number of clean reads is ∼24 million. The ChIP-seq data have been deposited into National Center for Biotechnology Information Gene Expression Omnibus with the accession number (GSE120022, https://www.ncbi.nlm.nih.gov/geo/query/acc.cgi?acc=GSE120022). The primer sequences of Bcl3, Crtc2, Bach2, Stat4, and Stim1 for ChIP–qPCR analysis were listed in the Supplemental Table I. For STAT3 binding motif analysis, the overlapping regions between the two differential peak lists were ranked by the differences between control and cKO reads, and peaks that had fewer than 10 more reads were removed. The sequences were used as input into the MEME motif discovery software, using the One Occurrence Per Sequence model. Control or cKO mice were immunized by i.p. injection of 25 μg of OVA and 1 mg of Alum adjuvant, then boosted with the same treatment 14 d later. On day 21 post-initial immunization, mice were anesthetized with isoflurane and challenged intranasally with 250 μg of OVA in 30 μl of PBS. Intranasal challenge was repeated on days 22 and 23, then mice were sacrificed on day 24. For microscopy, lobes of the lung were filled with and submerged in blocks of optimal cutting temperature compound before rapid-freezing at −140°C for storage. Lung cryosections at optimal cutting temperature were sliced 9-μm thick and fixed in acetone. For immunofluorescence, slices were blocked, stained with fluorescently labeled Abs FITC-CD11b and APC-CD193 (BioLegend) at 1:100 dilution overnight, then washed and stained with DAPI nuclear dye for 10 min before final wash and mounting. Images were acquired using a confocal microscope at 60× magnification (Nikon). For immunohistochemistry, slices were blocked overnight and stained with purified Gr-1 Ab at 1:50 dilution overnight. Slides were then washed and stained with secondary HRP-labeled Ab (BioLegend) at 1:1500 dilution for 25 min, washed and developed with peroxidase substrate (Vector Laboratories) for 10 min, then washed and counterstained with Hematoxylin QS (Vector Laboratories) for 45 s before final mounting. Images were acquired using an Aperio ScanScope digital scanner. All quantitative data are shown as mean ± SEM unless otherwise indicated. All samples were compared using a two-tailed unpaired Student t test. A p value <0.05 was considered significant. Statistical analysis was performed with GraphPad Prism software. STAT3 has previously been shown to play a role in the formation of the GC following immunization (22). Because B cell and Tfh interactions are crucial to the generation of an effective humoral immune response, we used a CD2 promoter–driven Cre to investigate the effect of loss of STAT3 in these populations during a Th2-type immunization (23). At 7 d postimmunization, a difference in Ag-specific IgE Ab titer could not be observed in the serum. However, levels of IgG and subclass IgG1 were significantly reduced at this time point. 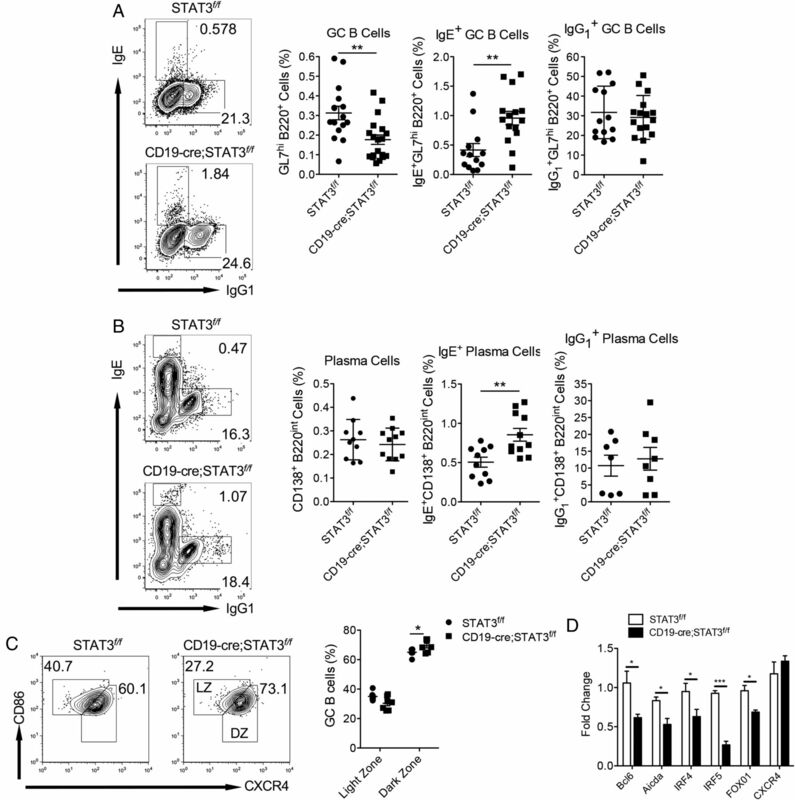 By 14 d postimmunization, a marked increase in IgE was observed in CD2-cre; STAT3fl/fl mice. IgG and IgG1 also maintained their decreased titers to this period (Fig. 1A). STAT3 regulates IgE class switching in a Th2-type response. STAT3f/f control or CD2-Cre; STAT3f/f mice were immunized i.p. with 100 μg OVA in Alum. (A) Sera were collected at indicated time points and OVA Ab levels of different isotypes (IgE, IgG, and IgG1) were detected by ELISA. Data are means ± SEM. (B and C) FACS analysis of splenocytes from day 14 postimmunization mice. Cells were stained with mAbs B220, GL7, CD138, IgG1, and intracellular IgE. Cells were gated based on the corresponding isotype control mAb staining. Representative dot plots and summarized results are shown from at least three independent experiments. Data are means ± SEM. *p < 0.05, **p < 0.01, ***p < 0.001, ****p < 0.0001, unpaired two-tailed Student t test). Deletion of STAT3 on B cells and T cells caused impairment in GC formation. At day 14, STAT3 KO mice had significantly reduced overall GC frequency in the spleen compared with littermate controls (Fig. 1B). Within the GC population, there was also a shift in Ab class expression mirroring that seen in the peripheral blood. The amount of intracellular IgE–expressing GCs was significantly increased in STAT3 knockout mice. IgG1-expressing GCs appear to be slightly reduced, although the reduction is not statistically significant. Ab-producing plasma cells were also affected by loss of STAT3. Although the frequency of plasma cells in the spleen was not markedly altered, their expression of Ab class was (Fig. 1C). Knockout mice demonstrated a substantial increase in IgE-producing plasma cells, whereas those of the IgG1 isotype were significantly reduced. Because of this apparent disruption of the GC reaction, we opted to investigate the overall affinity of Ab produced in this model by immunizing mice with NP23-CGG (24). Plates were coated with highly conjugated NP23-BSA, which is able to bind low- and high-affinity anti-NP Ab, or a much lower ratio NP2-BSA, which only binds high-affinity Ab. An increased NP2/NP23 OD value ratio conveys a higher overall affinity of anti-NP Ab produced (25). IgE Ab produced by STAT3 KO mice was significantly lower affinity than controls, indicating a clear defect in affinity maturation in the GC (Supplemental Fig. 1A, left). Despite this decreased affinity, STAT3 KO mice still produced greater amounts of IgE as indicated by absolute absorbance (Supplemental Fig. 1A, right). IgG1 affinity was also reduced in knockout mice (Supplemental Fig. 1B). These data suggest a critical role for STAT3 in the regulation of IgE class switching within the GC reaction and its plasma cell differentiation. Tfh and B cell interaction drives the formation and maintenance of the GC reaction. However, it is B cells that make up the majority of the structure and undergo a more drastic amount of change and regulation (26). Thus, we sought to determine if the STAT3- dependent regulation of GC class switching was an effect specifically intrinsic to the B cell population. We used a CD19-Cre–driven knockout model to examine these effects. To better understand the kinetics of this effect, multiple time points were observed. As early as day 7, Ag-specific IgG Abs in the serum were decreased, whereas IgE was elevated as seen in the CD2-Cre model (Fig. 2A). At day 14, these effects were even more pronounced. Additional isotypes were analyzed for this time point, demonstrating a decrease in serum IgM and a decrease in IgG subclasses IgG1, IgG2a, and IgG2b (Fig. 2B). STAT3 regulation of class switching is a B cell–intrinsic effect. STAT3f/f control or CD19-Cre; STAT3f/f mice were immunized i.p. with 100 μg OVA in Alum. (A and B) Sera were collected and anti-OVA Ab levels of different isotypes were detected by ELISA at given dilutions. All data are from day 14 postimmunization unless otherwise noted. Summarized results are from at least three independent experiments. Data are means ± SEM. (C) Control and cKO mice were immunized with 50 μg NP23-CGG in Alum via i.p. Serum was collected day 14 postimmunization. IgE and IgG1 were analyzed by ELISA with NP2-BSA and NP23-BSA coated plates. Ratio of NP2 to NP23 absorbance (left) and absolute absorbance (right) are shown. Data are means ± SEM. *p < 0.05, **p < 0.01, ***p < 0.001, ****p < 0.0001, unpaired two-tailed Student t test. Analogous to the previous experiment, the progression of the GC reaction was also investigated. The GC is typically fully formed by 7 d postimmunization (26, 27). Predictably, we found a marked and significant decrease in GC B cells at this time (Supplemental Fig. 2A). Within the GC, cells switched to the IgE class were markedly increased. Similar to the later time point, IgG1-expressing GC frequency was also decreased. The plasma cell population was less impacted at day 7, showing no change in number or IgG1 class switching. The IgE-expressing subset, however, increased (Supplemental Fig. 2B). At 14 d postimmunization, these phenotypes became even more striking. The GC fraction was reduced in the absence of STAT3, whereas the IgE class subset was increased. The IgG1 subset was not altered at this time point (Fig. 3A). Plasma cells demonstrated the same marked increase in the IgE+ population but showed no other significant changes (Fig. 3B). We also noticed that IgE staining pattern was different from that in CD2-cre; STAT3f/f mice. However, all IgE+ populations were defined based on the corresponding isotype mAb stainings. 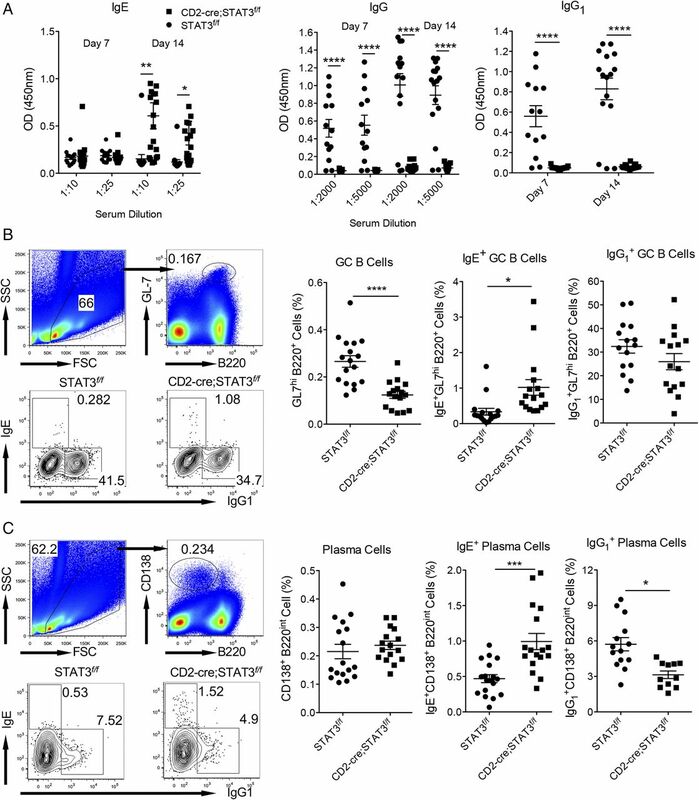 STAT3 regulates GC and plasma cell IgE class switching in B cells. (A and B) STAT3f/f control or CD19-Cre; STAT3f/f mice were immunized i.p. with 100 μg OVA in Alum. FACS analysis of splenocytes from day 14 postimmunization mice. Cells were stained with mAbs B220, GL7, CD138, IgG1, and intracellular IgE. Representative dot plots and summarized results are from at least three independent experiments. Cells were gated based on the corresponding isotype control mAb staining. Data are means ± SEM. (C) FACS analysis of GC light zone and dark zone distribution. Cells were stained with mAbs B220, GL7, CXCR4, and CD86. Representative plots are gated on B220+GL7+. Summarized results are from two independent experiments. Data are means ± SEM. (D) GC gene expression of Bcl6, Aicda, IRF4, IRF5, FOXO1, and CXCR4 was measured using quantitative reverse transcriptase–PCR. GC cells were sorted from day 14–immunized WT or cKO mice. Data are means ± SEM. *p < 0.05, **p < 0.01, ***p < 0.001, unpaired two-tailed Student t test. Within the GC structure, actively maturing GC B cells cycle between two distinct compartments. The light zone of the GC contains APCs that drive selection of high-affinity B cells through competition for survival signals, whereas the dark zone is the site of B cell proliferation and SHM that results from successful light zone selection (28). We suspected that dysregulation of the migration of GC B cells between these two paradigms may be involved in the irregular class switching in the STAT3-deficient model. Analysis of CD86 and CXCR4 expression within the GC population demonstrates a slight increase in the dark zone fraction over the light zone fraction in CD19-cre; STAT3fl/fl mice (29) (Fig. 3C). Transcription factor Bcl6 is a master regulator for GC function and formation (30, 31). Because of the decrease in GC formation in the STAT3-deficient mice, we sought to determine Bcl6 mRNA expression levels. Analysis showed lower Bcl6 expression in knockout mice compared with controls at day 14 (Fig. 3D). We also observed lower expression of Aicda, which is involved in SHM and class switch recombination in the GC (28). Next, we examined expression of IRF4 and IRF5, which have been linked to class switch regulation and B cell differentiation, respectively (32, 33). These, too, were under expressed in knockout mice. FOXO1, which is vital for the formation and maintenance of the dark zone stage of the GC reaction, was also downregulated in these cells (28). Interestingly, expression of dark zone chemokine receptor CXCR4 was not altered despite the observed difference in GC dark zone and light zone distribution. These data suggest STAT3 plays a key upstream regulatory role for several key genes in GC formation. Previous studies have successfully established an in vitro system to replicate the in vivo GC reaction (6). We aimed to determine if the STAT3 deficiency in B cells would replicate the previously observed phenotype under these conditions. Culture of purified STAT3 knockout B cells in the presence of IL-4 and CD40L- and BAFF-expressing feeder cells produced fewer GC B-like cells at 96 h and induced less cell proliferation in general but no changes in IgE expression (data not shown). Secondary culture with CD40L and IL-21 for 72 h caused partial differentiation into plasma-like cells although maintaining a large portion of GC B-like cells. After this secondary differentiation, STAT3 knockout cultures maintained a reduced rate of overall expansion compared with controls (Fig. 4A) In addition, STAT3 knockout B cell culture continued to have reduced GC B-like frequency (Fig. 4B) However, these cells experienced greater IgE and less IgG1 class switching, mimicking the phenotype observed using in vivo Th2-driven immunization models. The plasma cell–like population also demonstrated similar results, displaying an increased overall frequency, increased IgE switching, and decreased IgG1 isotype subset (Fig. 4C). STAT3 regulates IgE class switching of in vitro–generated GC B cells. (A) Purified B cells from STAT3 control and cKO mice were cultured with CD40L- and BAFF-expressing feeder cells in the presence of IL-4 for 96 h, followed by secondary culture with feeder cells and IL-21 for 72 h. Cells were harvested and stained with mAbs CD138, GL7, IgG1, and intracellular IgE. Total cell number of secondary culture was evaluated by hemocytometer. Data are means ± SEM. (B) FACS analysis of iGB, IgG1, and IgE expression. Representative plots are gated on CD138− GL7+ cells. Data are means ± SEM. (C) FACS analysis of plasma cell IgG1 and IgE expression. Representative plots are gated on CD138+ cells. Data are means ± SEM. Summarized data are from at least three independent experiments. (D and E) Gene expression of Bcl6, Aicda, IRF4, IRF5, FOXO1, and CXCR4 was measured using quantitative reverse transcriptase–PCR. Cells were sorted from day 7–cultured WT or cKO GC B-like (D) and plasma-like (E) cells. Data are means ± SEM. Summarized data are from at least three independent experiments. *p < 0.05, **p < 0.01, ***p < 0.001, unpaired two-tailed Student t test. mRNA expression analyses were performed on the end-stage GC B-like and plasma cell–like populations to further confirm replication of the in vivo phenotype. GC B-like cells maintained significantly decreased expression of the GC genes Bcl6, Aicda, IRF4, IRF5, and FOXO1 (Fig. 4D). Unlike the in vivo GCs, CXCR4 expression was decreased in these cells. Plasma-like cells also mimicked an in vivo expression pattern, with decreased Aicda, IRF4, and IRF5 (Fig. 4E). 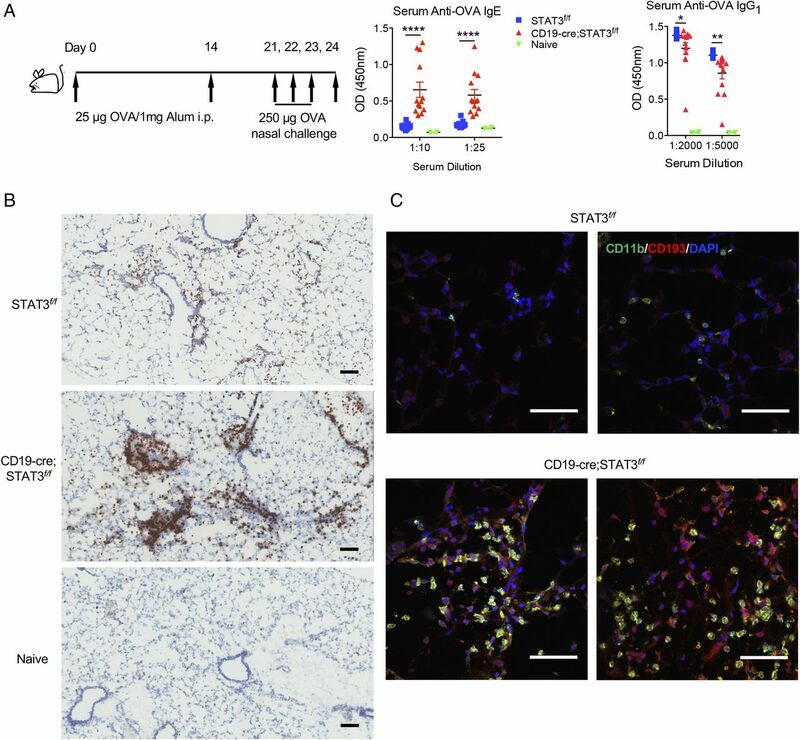 These data confirm the in vivo effect of STAT3 deficiency seen in mice and suggest that this effect is a result of signaling via the IL-4, IL-21, or CD40 pathways used in the GC reaction. To further identify the direct or indirect target genes of STAT3 in the GC B cells, a STAT3 ChIP-seq study was carried out. In total, 3571 STAT3 binding sites were identified; most of them were located in introns or intergenic regions (Fig. 5A), suggesting that STAT3 may regulate gene expression through binding to distal regulatory elements. Gene Ontology analysis of differential peak–related genes suggested that these genes are related to biological processes, such as immune regulation and metabolic process, cellular component, and molecular function (Supplemental Fig. 3A). Ranking of genes associated with STAT3 based on the absolute number of sequencing tags, Bcl3 and Crtc2 were identified as the genes with the greater recruitment of STAT3 (Fig. 5B). In addition, Bach2, Stim1, and Stat4 also had binding sites of STAT3 (data not shown). Interestingly, STAT3 itself was also found to be among the direct STAT3-regulated targets (data not shown). STAT3-bound genes in GC B cells. In vitro–cultured GC B cells from STAT3 control and cKO mice were used for ChIP-seq study. (A) The genomic distribution (%) of the identified STAT3 binding sites in GC B cells. (B) Quantitative correlation of STAT3 at the Bcl3 and Crtc2 loci. (C) Chromatins from STAT3 control and cKO mice were performed by ChIP-qPCR analysis for Bcl3, Crtc2, Bach2, Stat4, and Stim1. Percentage of input was calculated using corresponding input as base level. (D) De novo–derived STAT3 DNA binding motif. De novo motif was identified from the STAT3 ChIP-seq binding sites using MEME software. To validate results from ChIP-seq experiments, five STAT3-bound genes identified by ChIP-seq, including Bcl3, Crtc2, Bach2, Stat4, and Stim1 were selected. Bcl3 and Crtc2 showed strong binding to STAT3, whereas Bach2, Stat4, and Stim1 showed weak to no binding using in vitro–induced GC B (iGB) from STAT3 control and cKO mice (Fig. 5C). This was also confirmed using iGB from wild-type (WT) mice immunoprecipitated with STAT3 mAb or isotype control mAb (Supplemental Fig. 3B). We also searched the STAT3 binding motif using differentially expressed sequences between STAT3 control and cKO GC B cells. A de novo STAT3 binding motif was discovered (Fig. 5C), suggesting that target genes with the STAT3 binding motif may be involved in STAT3-regulated GC B cell differentiation and IgE isotype switching. Increased production of IgE is a well-known hallmark of allergic disease. Asthma, in particular, has been strongly linked with the production of IgE Abs specific to a wide range of allergens (34). We thus tested the response of CD19-cre; STAT3fl/fl mice in an induced asthma-like disease model. Briefly, mice were sensitized to OVA via immunization, then challenged intranasally thrice before sacrifice and analysis (Fig. 6A). STAT3 deficiency causes increased inflammation in an asthma-like model. (A) Schema of the inhalation model. STAT3f/f control or CD19-Cre; STAT3f/f mice were immunized i.p. with 25 μg OVA/1 mg Alum, then boosted 14 d later. On day 21 postimmunization, mice were anesthetized and challenged with 250 μg OVA intranasally, followed by repeated challenges on days 22 and 23. Mice were sacrificed on day 24. Sera were collected at indicated time points and anti-OVA Ab levels of different classes were detected by ELISA. Data are means ± SEM. Summarized data are from at least three independent experiments. *p < 0.05, **p < 0.01, ****p < 0.0001, unpaired two-tailed Student t test. (B) Immunohistochemical staining of Gr-1 cells in the lungs of day 24 mice. Tissue was probed with Gr-1 Ab, targeted with HRP-labeled secondary Ab, and developed with peroxidase substrate. Scale bar, 100 μm. Images were acquired by Aperio ScanScope digital scanner. Lung sections from naive mice were used as control. (C) Immunofluorescence staining with FITC-CD11b, APC-CD193, and DAPI in the lungs of day 24 mice. Scale bar, 50 μm. Images were obtained using Nikon ECLIPSE Ti fluorescence microscopy. Representative images from two mice in each group are shown. Consistent with our previous immunization models, CD19-cre; STAT3fl/fl mice continued to display a strong phenotype of increased serum Ag-specific IgE production as compared with control mice (Fig. 6A). Immunohistochemistry staining of the lungs revealed massive infiltration of Gr-1+ leukocytes, which mainly include neutrophils and eosinophils. In contrast, STAT3-proficient control mice had remarkably less infiltration but were still increased compared with naive mice (Fig. 6B). Furthermore, immunofluorescent staining of the lung tissue showed drastically more CD11b+CD193+ eosinophil infiltration in CD19-cre; STAT3fl/fl mice (Fig. 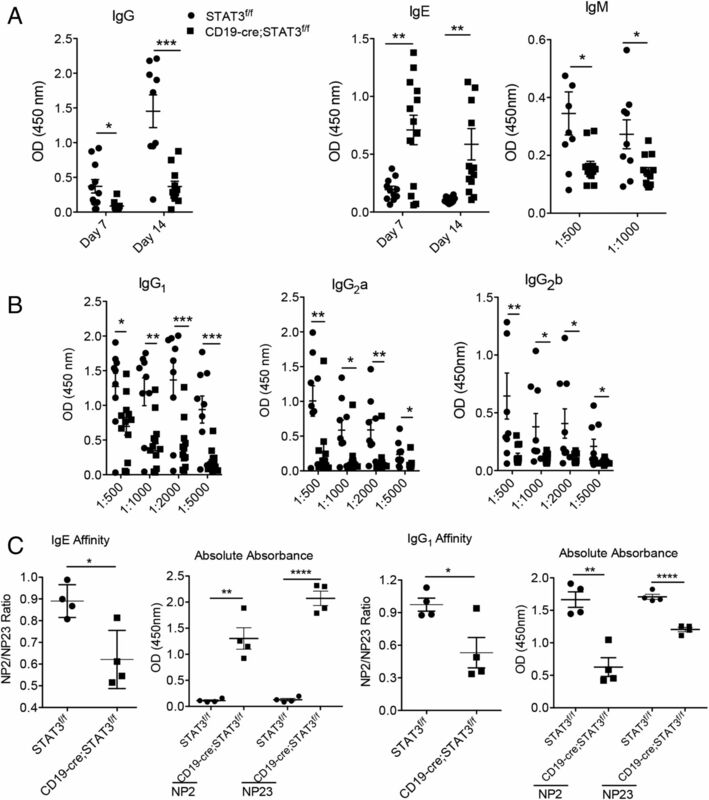 6C), suggesting that STAT3 deficiency in B cells promotes allergy-induced lung inflammation. STAT3 is a central and essential signaling molecule for many different cell types. In this study, we have shown its function in B cells as a negative regulator of IgE class switching in the GC reaction. 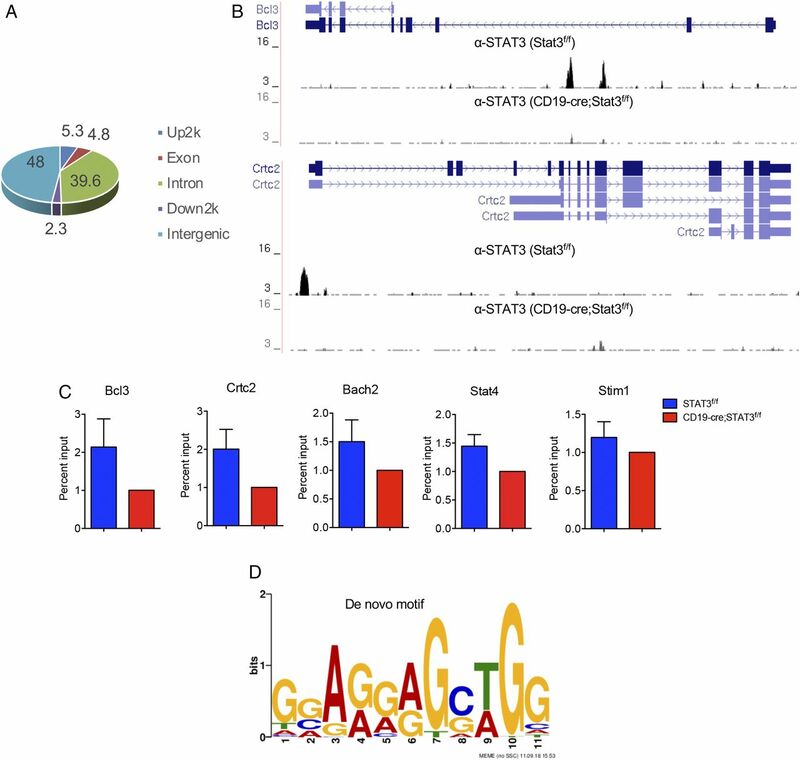 Previous work by other groups has demonstrated STAT6 plays a critical role in the regulation of IgE germline expression in response to IL-4 upstream signaling (35). Nonfunctional mutations in STAT3 have been strongly associated with incidence of AD-HIES. However, how STAT3 dysfunction leads to increased IgE production is unclear. Our group recently found that STAT3 deficiency leads to a defect in GC formation and IgG Ab production following human RBC immunization and Th1-type immune responses in mice (16, 22). These data in combination with novel findings that IgG1 GC B cells are able to sequentially switch to IgE led us to investigate the impact of STAT3 on this pathway (36, 37). Stable interaction of Tfh with B cells is a pillar of the GC reaction. STAT3 has already been shown to regulate Tfh differentiation and GC participation, but the function of STAT3 in GC B cells is not well studied (38, 39). Using a CD2-Cre–driven model to knock out STAT3 in both these cell types, we revealed a defect in GC formation and IgG1 production under Th2-driven immunization, mirroring prior studies using Th1 reactions (22). However, a STAT3 knockout–driven increase in production and class switching of IgE Ab has not been previously reported, suggesting this may be a Th2-dependent phenomenon. Despite the importance of STAT3 in Tfh maintenance, use of a B cell–specific knockout CD19-Cre model was able to replicate this phenotype, suggesting a B cell–intrinsic defect. The reproduction of this phenomenon using B cell in vitro systems further supports this conclusion. Interestingly, the frequency of Ab-producing plasma cells was unchanged following immunization despite the decrease in frequency of GC B cells, whereas the IgE-expressing subpopulation increased. This suggests that the effect of the STAT3 defect is limited to the GC reaction, whereas the proliferation of the end-stage plasma cell product is not significantly affected. We also showed that loss of STAT3 causes a disruption in the light zone and dark zone distribution of GC B cells. Migration between the light zone and dark zone of the GC is an essential part of the class switch and affinity maturation process controlled by factors such as FOXO1, PI3K, and CXCR4 (28, 29, 40). Indeed, FOXO1 expression was reduced in all STAT3-deficient GCs, although CXCR4 was unchanged in in vivo GC B cells. In other cell types, STAT3 has been shown to bind to the FOXO1 promoter and upregulate expression and, thus, may be directly controlling FOXO1 in B cells as well (41). Notably, we did demonstrate reduced IgE affinity in both CD2-Cre and CD19-Cre models despite increased overall IgE production. This further implicates the STAT3 effect on not only GC formation, but the efficacy of the Abs it generates as well. However, it remains unclear whether the disruption in IgG1/IgE class switching and affinity maturation is a direct consequence of the light zone/dark zone distribution defect or another unrelated symptom of STAT3 deficiency. Class switching occurs in mature B cells in response to Ag stimulation and costimulatory signals. Excision of the DNA between the baseline μ promoter and downstream effector promoters causes expression of a new Ab class (42). IgE is unique in that and this process may happen either via a direct switch from IgM, or through sequential switch first to the IgG class followed by further switching to the downstream IgE promoter (42, 43). Our findings suggest that STAT3 suppresses this sequential switching pathway, indicated by the associative drop in IgG1 and elevated IgE expression. This observation would suggest STAT3 may also be dampening the effectiveness of the IgE Ab response, as sequential switching produces higher affinity Ab than direct switching (25). However, we have found reduced IgE affinity in our knockout models, indicating a more complex role for STAT3 in IgE production. Direct regulation of both IgG1 and IgE class switching is reliant on Th2 cytokine signaling, most notably IL-4. STAT6 acts downstream of IL-4, binding to the Iε promoter and initiating IgE expression (44). Critical GC regulator Bcl6 has binding sites within the Iε promoter, which overlap those of STAT6, acting as an antagonist (45, 46). STAT3 acts as an enhancer of Bcl6 expression and has confirmed binding sites within the Bcl6 promoter (47, 48). Indeed, GC Bcl6 expression was reduced in both our STAT3-deficient in vivo and in vitro models. Therefore, STAT3 may be acting as a negative regulator of IgE class switching via enhancement of STAT6 competitor Bcl6. STAT3 activation also causes increased expression of IRF4, which is required for GC formation (49, 50). We observed reduced IRF4 expression in knockout GCs and plasma cells. IRF4 downstream targets Aicda and IRF5 were reduced as well, which are vital in class switch regulation and B cell differentiation, respectively (32). These findings implicate STAT3 as a major upstream regulator of GC formation, function, and class switching. However, STAT3 ChIP-seq analysis reveals that none of these genes are identified as direct targets of STAT3. In addition, ID2 and NFIL3, two transcription factors critical for controlling IgE class switching, do not have direct STAT3 binding sites, suggesting that STAT3 may use an unidentified factor(s) to regulate IgE isotype switching in the GC B cells (51, 52). 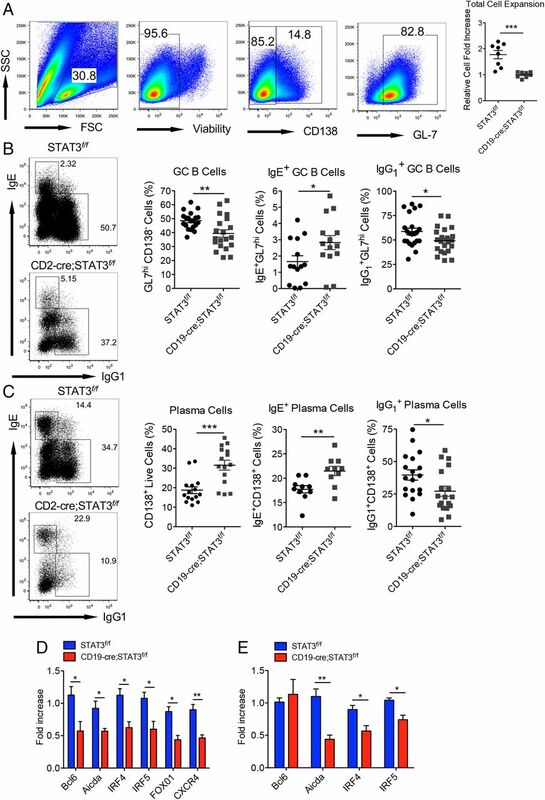 It is also possible that STAT3 targets of in vitro–cultured GC-like B cells are different from in vivo primary GC B cells despite their similar phenotype. Notably, Crtc2 has a strong binding site on STAT3. Crtc2 is a transcriptional coactivator for CREB1 (cAMP response element). Previous studies demonstrate that Crtc2 plays an important role in plasma cell differentiation and GC B cell malignancy (53, 54). Interestingly, Aicda, Myc, Bach2, TCF3, and TCL1 are among 136 direct Crtc2 target genes (54). It is possible that STAT3 may regulate GC differentiation and IgE isotype switching through Crtc2. In humans, STAT3 mutations have been strongly linked to the incidence of AD-HIES, also known as Job syndrome (55, 56). IgE is also known to mediate inflammatory symptoms in several allergic respiratory disorders (57). Additionally, STAT3 has been demonstrated to be involved in Th2 differentiation that may contribute to asthma disease (9). Despite high levels of IgE, AD-HIES patient prevalence of allergy, anaphylaxis, and asthma condition is much less than that of other IgE related diseases (58). Inhibition of STAT3 in lung epithelial cells can even prevent lung inflammation in some asthma models, suggesting a protective role against allergy reaction in certain tissues (59). We demonstrated an increased eosinophil and inflammatory response in the lungs of CD19-Cre–driven knockout mice challenged in an asthma model, indicating B cell STAT3 is an effector of the allergic lung response. However, this effect is likely ablated in many AD-HIES patients by the protective loss of STAT3 in other tissues. It remains to be seen if other hyper IgE disease hallmarks, such as susceptibility to recurrent pyogenic pneumonias, can also be caused by B cell STAT3 deficiency in mice (60). Impairment of the IgG response magnitude and affinity because of defective STAT3 are likely significant contributing factors to these frequent infections. Mice expressing a nonfunctional form of STAT3 were previously shown to be more susceptible to Citrobacter rodentium infection and inflammation of the colon, further supporting the role of STAT3 in protection from bacterial infection (19). In summary, we have shown that STAT3 is able to control IgE class switching indirectly through regulation of vital upstream factors, which can alter the inflammatory response in the lungs. These newly discovered factors may serve as potential therapeutic targets for treatment of AD-HIES patients and other IgE related diseases. This work was supported by National Institutes of Health (NIH) Grants AI124235 and AI124081 (to J.Y.) and NIH Grants HL113530 and HL78825 (to R.B.). J.Y. is supported by the Kentucky Bucks for Brains Program. Bioinformatics support for this work was provided by NIH Grant P20GM103436. The sequences reported in this article have been submitted to the Gene Expression Omnibus (https://www.ncbi.nlm.nih.gov/geo/query/acc.cgi?acc=GSE120022) under accession number GSE120022.
. 2007. Anti-IgE antibodies for the treatment of IgE-mediated allergic diseases. Adv. Immunol. 93: 63–119.
. 2012. Heterozygous signal transducer and activator of transcription 3 mutations in hyper-IgE syndrome result in altered B-cell maturation. J. Allergy Clin. Immunol. 129: 559–562, 562.e2.
. 2016. IL-21 signaling in immunity. F1000Res. 5: 224.
. 1994. Switch circles from IL-4-directed epsilon class switching from human B lymphocytes. Evidence for direct, sequential, and multiple step sequential switch from mu to epsilon Ig heavy chain gene. J. Immunol. 152: 3427–3435.
. 2008. STAT3-mediated up-regulation of BLIMP1 is coordinated with BCL6 down-regulation to control human plasma cell differentiation. J. Immunol. 180: 4805–4815.
. 2015. Molecular mechanisms of IgE class switch recombination. Curr. Top. Microbiol. Immunol. 388: 21–37.